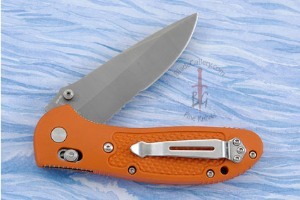 Description: The Griptilian MDP, designed by Mel Pardue, is a modified drop point with thumb stud opener. It offers extreme durability in its rugged construction. At the heart of the design is the unmatched strength of the AXIS locking mechanism. The handle, molded of Noryl GTX, is textured for optimum grip and fit to the hand. 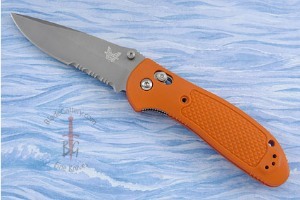 Unleash the Griptilian's performance with a simple thumb rotation. Safe, reliable, smooth, and affordable. 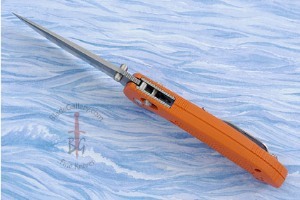 The 551SH20 features X15-TN, a French stainless steel developed for the aircraft industry for jet ball bearings, as well as the medical industry for scalpels. It has the ability to resist rust in the worst of conditions while maintaining ample edge retention. The capability behind this steel is in the way it is manufactured, resulting in the finest steel for use in harsh environments such as salt water. An excellent choice for marine environments or any aquatic pursuit.